This image was captured at Walton Hall, West Yorkshire. 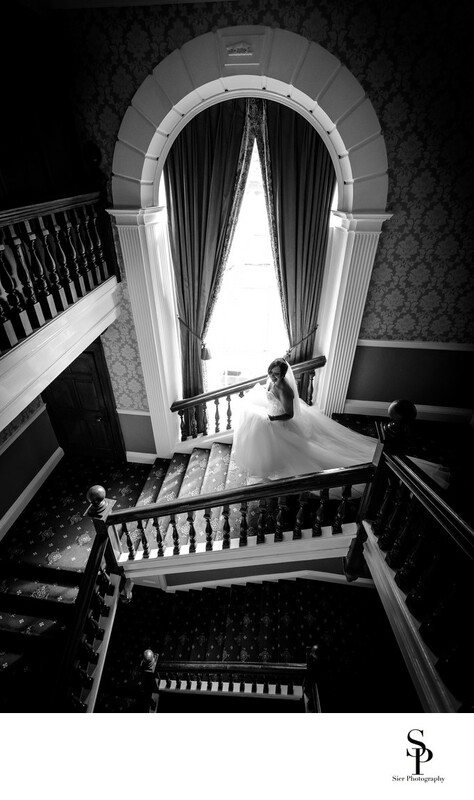 In the photograph the bride is descending the main staircase within the hall, the staircase features this magnificent window running between the first and second floors and is truly amazing. Walton Hall is the centrepiece of the Waterton Park Hotel and is a beautiful Grade II* listed building which nestles in the centre of a vast lake reached by an iron footbridge which is also Grade II* listed. This is an unbelievably beautiful backdrop for wedding images as are many of the locations around the grounds and the island. 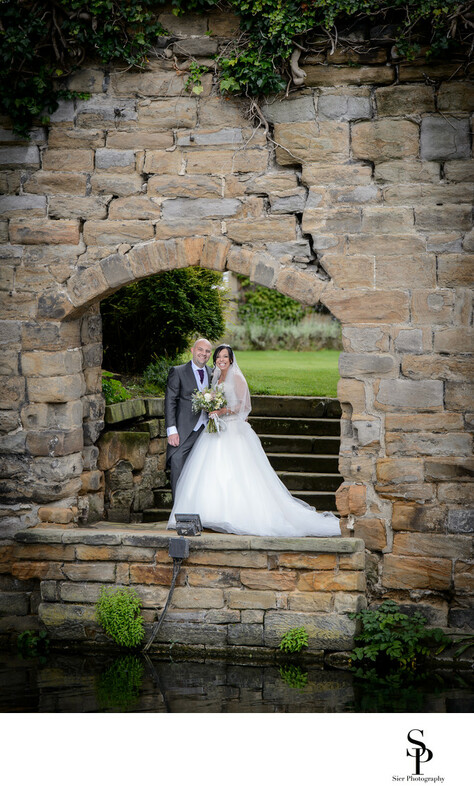 All the images shown were captured as part of this wonderful summer wedding at Walton Hall with the weather only threatening to break but behaving itself very well in the end. The wall of the island also has this intriguing arch overlooking the moat and acts to frame images nicely. We love to explore new venues as part of our wedding day work. We had already been and scouted out the venue a couple of weeks before so we had an idea of what we would encounter on the wedding day itself, but this is no real substitute for getting down to business. We are often asked if we have photographed at a venue before and more often than not something new presents new opportunities for us and allows us to unleash our photographic eye. 1/200; f/4.0; ISO 2500; 17.0 mm.